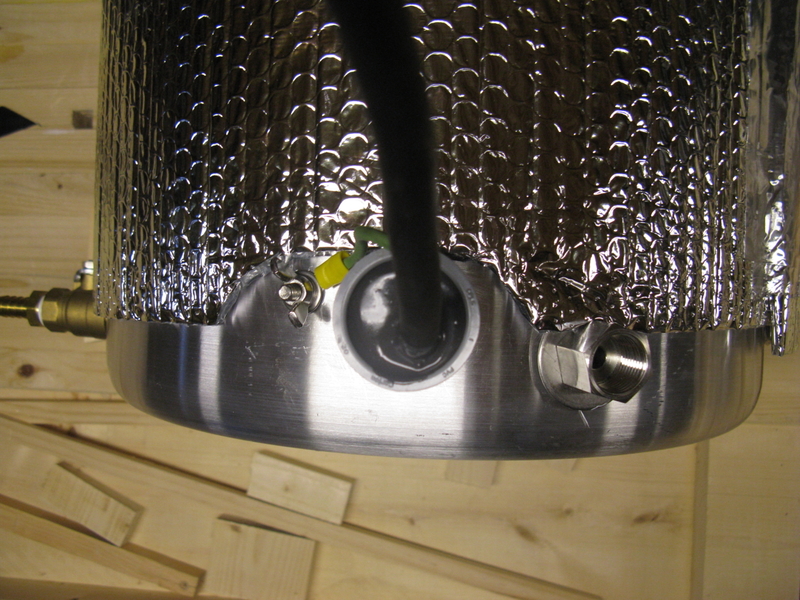 This is the next post in the series on my electric hot liquor tank. You can reference the intial post here. I want to reiterate my warning about mixing electricity with water. It can be deadly, and if you decide to venture into this, you do so at your own risk. Please get the help of someone who knows what he is doing, like an electrician. This is just to document what I did, and is not meant to be any sort of expert opinion or instructions. So, if you get hurt, it is your own fault. The common outlets you plug into in your house are wired for 110 volt. I know the voltage is 110, so I looked at my breaker panel, and all of my circuits are on 20 amp circuits with 12 gauge wire. Generally, the lower the gauge number, the thicker the wire, and the more amps it can take. Wires heat up as they are in use, and if you run to much amperage through too thin a wire, you can melt the insulation and start a fire, so it is important to use a wire thick enough to handle what you want to do. As the max on this circuit is 20 amps, and my circuit is 12 gauge wire, I just used the same thing on the cord for the tank. You actually don’t want to pull a full 20 amps through a 20 amp circuit breaker, however. For safety, the most I would want to pull is 80% of what the circuit can handle, so in my case, I wanted to keep it under 16 amps. The power to heat the hot water tank comes from a simple, 1500 watt hot water tank element. I got mine at Home Depot, where I also picked up 6 feet of 12 gauge 3 wire cord, and a plug with a ground to fit the standard outlet. I choose this element because it is cheap, and using the equation above, I figured out it was going to pull 13.6 amps, under my safety threshold for the circuit. Your outlets and plugs are also rated for amperage, and most are going to be set for 15 amps, so again, I figured this was safer. I could have picked a 2000 watt element, but that would have pulled over 16 amps, and that was getting out of my comfort zone. I believe 2000 watts is the maximum made for 110 volt circuits. There are much higher watt elements, up to 5500, but they are set up for 220 volt circuits. While I was at Home Depot, I also got a 1 inch PVC conduit coupling from the electrical department, 2 packages of JB Weld, and some acetone. When I got home, I cut about 6 inches of the insulation off one end of the cord, leaving the wires with their own individual insulation intact. Inside there were 3 colored wires, white, black, and green. I trimmed the wires so the white and the back were fairly short, only about 1.5 inches, but the green I left about 6 inches long. I then attached the white and black wires to the element. Orientation did not matter. I then ran the conduit coupling over the cord, which does not have the plug attached, and down to the element. I pulled the ground wire out of the conduit, so it was sticking out back in the direction the cord goes into the conduit. 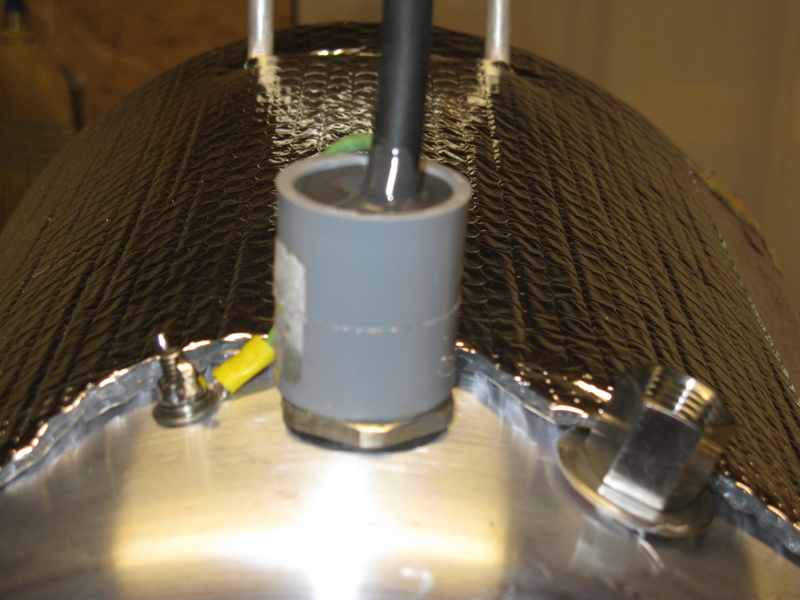 The coupling fit just over the where the wires attach, and sat fairly snug against the base of the element. Next, I mixed up one packet of the JB Weld in a glass jar that I was going to throw out anyway with just a bit of the acetone, just enough to make it pourable. It only took 1 tsp or so of acetone, not much. I clamped the element in a vice so it would stand up, with where the wires attach pointing up, and I poured the JB weld over where the wires attach, holding the conduit as tightly as I could to the base of the element. Once I knew I was not getting much leaking (you want the JB weld just thick enough to pour, but still very viscous so it does not leak out, think cold maple syrup) I clamped the conduit to the element, and let it sit for a few days. Tape around the joint between the base of the element and the coupling would proabaly have also worked. The JB weld hardened, giving me a waterproof seal over the connection. JB weld does not conduct electricity, and is rated up to 600F, so it seemed to be a good, safe choice. Once that was cured, and I was satisfied everything was covered, I applied the second package of JB Weld as I did the first, filling the conduit fully. This helped to anchor the outer insulation of the cord into the JB Weld, thus leading to less bending/wear and tear on the black and white wires. I then attached a circular terminal to the green ground wire that was sticking out of the conduit/ JB weld. I also then attached the plug to the other end of the cable. Using the nut and washer I purchased for this purpose, I threaded the element into the hole cut for it, and secured it into place. I then attached the ground wire to the outside of the kettle using the stainless steel bolt/washers/and nuts I described in my post about drilling the holes and the fittings. Once that was in place, my hot liquor tank was now ready to be electrified. I filled it with water, tested the seals for leaks, then tried plugging it in. It started to heat right up. The element is not really beefy enough to boil water, but that is not my intent. I usually put 8 gallons in the tank to start brewing. To raise 1 pound of water 1 degree F it takes 1 BTU. 1 gallon of water = 8.3#, so 8.3 x 8 = 66.4 pounds of water. I start with hot water out of the tap, and it is about 110F when I fill the tank. To raise 66.4 pounds 60 degrees F I need 3984 BTU’s. My element is 1500 watts, so in 1 hour I have 1.5 kilowatts/hr. 1 kilowatt/hr =3413 BTU’s, so this element delivers 5119.5 BTU’s per hour. So, in a perfect world, it would take 47 minutes to heat up the water. Of course, you lose heat to the ambient environment, and your element is not 100% effective (but it is pretty good being immersed in the water), but overall, it takes about 1 hour to heat up, which is about right. This suits my purpose very well, giving me plenty of hot water to do what I want it to do. I usually use about 5-6 gallons of water in total, but I fill the tank with more to always keep the element covered with water. This should seem obvious, but an element not submerged is going to burn out if you are lucky, or start a fire if you are not, so best to make sure it is covered. Ok, so with this, I have the heat source I need for the water, but not the control mechanism for the temperature. I will address that in upcoming posts. Should use cold water and not hot as hot water comes from your hot water tank and can have sediment and extra metal from being in the HWT that is corroding. Lookin good! Yes, there is the argument against using the hot water line. I can see the concern, primarily regarding mineral content of the water. However, I have a few things in my advantage in that regard. First, I live in a new house with new plumbing, so I have no lead concerns. Secondly, I have an indirect hot water tank system that runs off my boiler. The liner is a polymer, not metal. Finally, my water is super soft. Like, Plzen soft, with very low hardness and overall mineral content. I just add some metabisulfate to my HLT to remove the chlorine, and go from there. 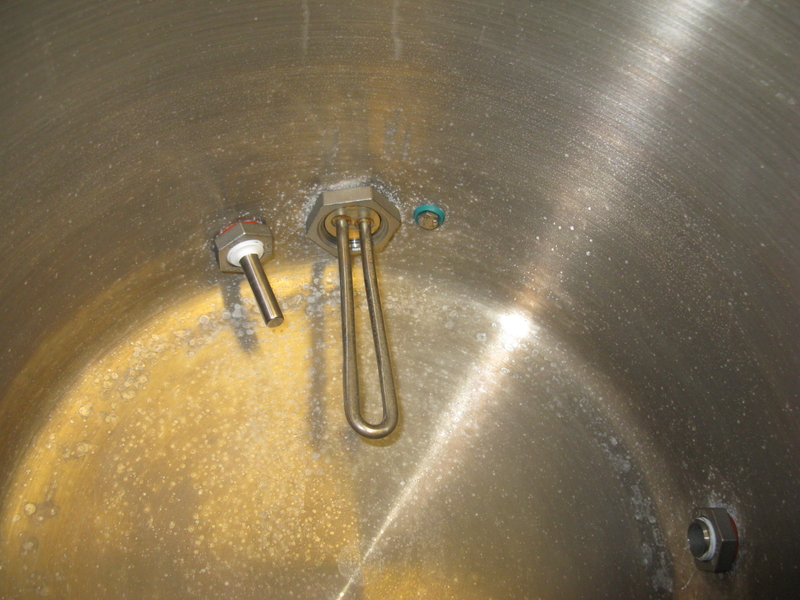 I could use cold water, but living in Maine, cold water is often very, very cold, so it will add considerably to the heating time of the HLT. However, it is wonderfully effective for chilling my wort! That being said, I have looked at it, and decided to not worry too much about it. If I had different circumstances, I would probably change my mind, but overall I am pretty comfortable with my current system.